As the ecosystem of creativity and R&D continue to evolve, we want to highlight the ongoing conversation of entrepreneurial hot spots Steve Blank has named “Innovation Outposts”. Establishing employees in these outposts can bring incredible value to a firm of any size looking to tap into new sources of inspiration and networking outside of the traditional office environment. The complexities of this new model of corporate entrepreneurship may not be right for every business (see The 6 Decisions to Make Before Setting up an Innovation Outpost). However, if you have weighed the benefits and implications, read on for an in-depth, step-by-step guide to launching your own innovation outpost. Now that your company has decided to set up an Innovation Outpost, how do you do it? How do you staff it? What should the team in the Outpost be doing day-to-day? In what order? Successful Innovation Outposts typically develop over a period of time through three stages. In the first stage the Outpost focusses on networking and partnering in the Innovation Cluster in which it is based (i.e. Silicon Valley, Boston). In the second stage, it moves into Investing, Inventing, Incubating and Acquiring technologies and companies, and in the third stage building product(s). Each stage needs a clearly defined set of objectives, and the right team to match those objectives. Could become threats that could lead to the disruption of the corporate parent. Could allow the corporation to be disruptive by entering adjacent markets to the ones it currently serves. Could create and introduce new and disruptive products and/or services for new markets. To make this happen the Outpost’s first employees must be technology connectors – people who understand the parent corporation’s strategy and can execute it tactically. One or two big strategic problems the corporation wants the Outpost to solve. For example, BASF wanted to keep pace with university R&D in inorganic materials and biosciences. Innovation areas the corporation is interested in. For example, the Silicon Valley outposts of automakers like Mercedes and BMW and automotive parts suppliers like Delphi are focussed on keeping pace with self-driving car technology. And take what it learns and regularly update the corporate engineering, strategy, VC groups and business unit heads, on technology and market shifts. For example, one of the big strategic problems a corporation may want its Outpost to solve is to connect the company to the leading PhD and faculty in specific departments at Stanford and Berkeley. A Stage 1 Outpost could partner with universities to set up a “Post Doc” center focusing on the strategic problem. It’s important to establish the ground rules for these partnerships, recognizing that working with startups requires two-way value exchange. Companies and their outposts must be willing to share their knowledge, data, and technology with startups and introduce them to their networks. In exchange, the startups provide companies with their disruptive ideas, technologies and business models. Therefore, the profile of the initial team to staff an Innovation Outpost should be a technology-savvy business development group. These Technology Connectors will have deep business development (partnering) experience so that they can network broadly within the startup ecosystem with entrepreneurs, startup management teams, venture investors and other intermediaries. Finally, it is essential that all of the Outpost team members are well-respected and networked within the corporation so that their recommendations can be heard and adopted by the CEO, board, and business unit (BU) executives. There’s nothing more wasteful than having an Innovation Outpost reporting on disruption heading for the company’s core business (autonomous vehicles, machine learning, Virtual Reality, Cloud, Internet of Things, et al.) when no one at headquarters wants to listen. For all these reasons, the team must consist of a small group of individuals reporting to a single leader, who in turn reports to the CEO. After its initial success in “sensing” the Innovation Cluster and partnering, the Outpost team has to assess how to “respond” to these threats and opportunities. Should the corporation invest, invent, incubate, or acquire? The answer to this question sets up the Outpost for Stage 2 of its growth. In stage 1 the Innovation Outpost was essentially an “early warning” and innovation identification vehicle for the company. For the majority of corporations having this stage may be sufficient to solve the 1-2 big strategic problems they’ve identified. However, the company may decide to expand the responsibilities of the Innovation Outpost to invest, invent, incubate, acquire or partner. In Stage 2, the corporation adds venture capital and/or mergers-and-acquisition teams to provide these functions. Examples of Stage 2 Outposts include: BMW’s Silicon Valley development group, working on self-driving vehicle technologies, while their venture group has been making investments in companies like ChargePoint and Nauto. And Qualcomm which invests around robotics and incubates in collaboration with Techstars. Before deciding to move to Stage 2, the CEO, exec staff and operating heads should revisit whether investing, inventing, incubating or acquiring startups can make an important contribution to the achievement of their corporate innovation goals. If the company needs immediate results, then identifying acquisitions, particularly of more mature companies, should be the priority. If the company has a longer term horizon, then investing or incubating should be considered. At times this means that the company must be willing to share knowledge, data, technology, and processes with these startups. In Stage 2, the corporation is starting to invest serious time and money in the Outpost. Therefore, it’s important to have a permanent executive running the Innovation Outpost and reporting to the company CEO. Appointing Outpost leadership as a temporary assignment leads to weak relations between the innovation ecosystem and the Innovation Outpost and increases the risk of failure. 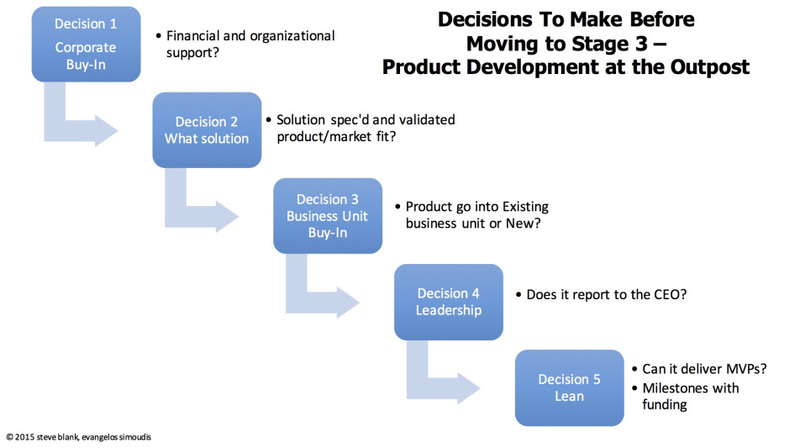 In Stage 3 an Innovation Outpost creates a product development group to bring to market the solution(s) (a product or service) to the challenge(s) that led to the establishment of the Outpost in the first place. Examples of Stage 3 Outposts include: Verizon (which has been developing their mobile video player, infrastructure, monetization/advertising and analytics product(s) in Silicon Valley; Walmart which has acquired, invested and been implementing their Commerce platform in their San Bruno center; and GE which has created a software development organization around big data, and their Predix platform, which works with GE units that focus on big data. Do we have corporate buy-in to build a product? – This is where the rubber meets the road. Is corporate willing to give both the financial and organizational support for product development in the Innovation Cluster? – Is the Outpost product officially part of a corporate Innovation Portfolio? What solution are we productizing? – Do we have an initial definition of the solution, have gotten out of the building and validated product/market fit and have a first pass of a validated business model. Where in the company will this new solution fit? – Do we have buy-in from existing business units for products that fit existing business models (Horizon 1) or extended business models (Horizon 2). Who will lead this new effort? – Four excellent examples of this transition include BMW’s brand, Verizon’s online video business unit, Telefonica’s Open Future business unit, and Samsung’s Connected Home business unit. Google’s Car organization is in the process of making this transition. Google just named the organization’s leader. Do we have a Lean Startup Methodology in place? – Can we deliver Minimum Viable products? – Do we have a go/no process – agreed with corporate – that ensure follow-on funding and deployment? At the end of Stage 3, the Outpost is ready for new challenges and the innovation cycle repeats.